Since observed by, Yours Faithfully, God”. Neither our thoughts nor imaginations, nor even the sensations which compose the objects of perception, can exist otherwise than in a mind perceiving them. Whence it follows that there is no other substance but spirit, or that which perceives. The very notion of what is called ‘matter’ involves a contradiction within it. In short, if there were external bodies, it is impossible that we should ever come to know it. The Philosophers’ puzzles ‘Whether corporeal substance can think,’ ‘whether matter be infinitely divisible,’ ‘how matter operates on spirit’ – and the like depend on the existence of matter, thus they have no longer any place in our principles. The soul itself is indivisible, incorporeal, unextended and is consequently incorruptible. It is evident that God is known as certainly and immediately as any other mind or spirit whatsoever. Men are surrounded with such clear manifestations of Deity, yet are so little affected by them that they seem, as it were, blinded with excess of light. Berkeley’s book is very forceful, and it is also very repetitive. For the most part, it is excision of unnecessary repetition which has shrunk this squashed edition down from 37,552 words to about 5,600. Very, very, little of the argument has been lost. Or, at least, that is what is in the Editor’s mind. WHEREIN THE CHIEF CAUSES OF ERROR AND DIFFICULTY IN THE SCIENCES, WITH THE GROUNDS OF SCEPTICISM, ATHEISM, AND IRRELIGION, ARE INQUIRED INTO. That a man who has written something with a design to promote Useful Knowledge and Religion in the world should make choice of your lordship for his patron, will not be thought strange by any one acquainted with the present state of the church and learning, and knowing how great an ornament and support you are to both. Thus I lay this treatise at your lordship’s feet. Philosophy being THE STUDY OF WISDOM AND TRUTH, it may be expected that those who have spent most time and pains in it should enjoy a greater calm and serenity of mind, and greater clearness of knowledge. Yet we see the illiterate bulk of mankind that walk the high-road of plain common sense, for the most part easy and undisturbed. But no sooner do we follow the light of a superior principle, to reason, meditate, and reflect on the nature of things, but a thousand scruples spring up, and we are insensibly drawn into uncouth paradoxes and forlorn Scepticism. The cause of this is thought to be the obscurity of things, or the natural weakness and imperfection of our understandings. Upon the whole, I am inclined to think that the far greater part, if not all, of those difficulties which have hitherto amused philosophers, and blocked up the way to knowledge, are entirely owing to ourselves – that we have first raised a dust and then complain we cannot see. It is the nature of the mind of man, assisted by words, to take the observations of nature and make from them ABSTRACTIONS and GENERALIZATIONS and to COMPOUND together one idea with another. Thus, the mind having observed this or that figure or magnitude, makes thereof a most abstract idea of extension. So likewise the mind distinguishes colours and makes an idea of colour in abstract which is neither red, nor blue, nor white. I find indeed I have a faculty of imagining or representing to myself the ideas of things I have perceived, and of variously compounding and dividing them. I can imagine a man with two heads, or the body of a horse. But I cannot by any effort conceive the abstract idea above described. It is impossible for me to form the abstract idea of motion distinct from the body moving, and which is neither swift nor slow, curvilinear nor rectilinear; and the like may be said of all other abstract general ideas whatsoever. I do not deny absolutely there are general ideas, but only that there are any ABSTRACT GENERAL IDEAS. Locke holds that such ideas are necessary, but they are not necessary for communication nor for the enlargement of knowledge. Unless we take care TO CLEAR THE FIRST PRINCIPLES OF KNOWLEDGE FROM THE embarras and DELUSION OF WORDS, we may make infinite reasonings upon them to no purpose; we may draw consequences from consequences, and be never the wiser. 1. OBJECTS OF HUMAN KNOWLEDGE. – It is evident to any one who takes a survey of the objects of human knowledge, that they are either IDEAS actually imprinted on the senses; or else such as are perceived by attending to the passions and operations of the mind; or lastly, ideas formed by help of memory and imagination – either compounding, dividing, or barely representing those originally perceived in the aforesaid ways. By sight I have the ideas of light and colours, with their several degrees and variations. By touch I perceive hard and soft, heat and cold, motion and resistance, and of all these more and less either as to quantity or degree. Smelling furnishes me with odours; the palate with tastes; and hearing conveys sounds to the mind in all their variety of tone and composition. And as several of these are observed to accompany each other, they come to be marked by one name, and so to be reputed as one thing. Thus, for example a certain colour, taste, smell, figure and consistence having been observed to go together, are accounted one distinct thing, signified by the name APPLE. Other collections of ideas constitute a stone, a tree, a book, and the like sensible things – which as they are pleasing or disagreeable excite the passions of love, hatred, joy, grief, and so forth. 2. MIND – SPIRIT – SOUL. – But, besides all that endless variety of ideas or objects of knowledge, there is likewise something which knows or perceives them, which I call MIND, SPIRIT, SOUL, or MYSELF. For the existence of an idea consists in being perceived. 3. HOW FAR THE ASSENT OF THE VULGAR CONCEDED. – That neither our thoughts, nor passions, nor ideas formed by the imagination, exist WITHOUT the mind, is what EVERYBODY WILL ALLOW. The table I write on I say exists, that is, I see and feel it; and if I were out of my study I should say it existed – meaning thereby that if I was in my study I might perceive it, or that some other spirit actually does perceive it. This is all that I can understand by these and the like expressions. Their ESSE is PERCIPI, nor is it possible they should have any existence out of the minds or thinking things which perceive them. 6. Some truths there are so near and obvious to the mind that a man need only open his eyes to see them. Such I take this important one to be, viz., that all the choir of heaven and furniture of the earth, in a word all those bodies which compose the mighty frame of the world, have not any subsistence without a mind, that their BEING (ESSE) is to be perceived or known; that consequently so long as they are not actually perceived by me, or do not exist in my mind or that of any other CREATED SPIRIT, they must either have no existence at all, OR ELSE SUBSIST IN THE MIND OF SOME ETERNAL SPIRIT – it being perfectly unintelligible, and involving all the absurdity of abstraction, to attribute to any single part of them an existence independent of a spirit. To be convinced of which, the reader need only reflect, and try to separate in his own thoughts the being of a sensible thing from its being perceived. 9. THE PHILOSOPHICAL NOTION OF MATTER INVOLVES A CONTRADICTION. – Some make a DISTINCTION betwixt PRIMARY and SECONDARY qualities. By the former they mean extension, figure, motion, rest, solidity or impenetrability, and number; by the latter they denote all other sensible qualities, as colours, sounds, tastes, and so forth. But they will have our ideas of the primary qualities to be patterns or images of things which exist without the mind, in an unthinking substance which they call MATTER. But it is evident that extension, figure, and motion are ONLY IDEAS EXISTING IN THE MIND, and that an idea can be like nothing but another idea, and that consequently neither they nor their archetypes can exist in an UNPERCEIVING substance. Hence, it is plain that that the very notion of what is called MATTER or CORPOREAL SUBSTANCE, involves a contradiction in it. 11. ARGUMENT AD HOMINEM. – Again, GREAT and SMALL, SWIFT and SLOW, ARE ALLOWED TO EXIST NOWHERE WITHOUT THE MIND, being entirely RELATIVE, and changing as the frame or position of the organs of sense varies. The extension therefore which exists without the mind is neither great nor small, the motion neither swift nor slow, that is, they are nothing at all. But, say you, they are extension in general, and motion in general: thus we see how much the tenet of extended movable substances existing without the mind depends on the strange doctrine of ABSTRACT IDEAS. But without extension solidity cannot be conceived; since therefore it has been shown that extension exists not in an unthinking substance, the same must also be true of solidity. 12. That NUMBER is entirely THE CREATURE OF THE MIND, even though the other qualities be allowed to exist without, will be evident to whoever considers that the same thing bears a different denomination of number as the mind views it with different respects. Thus, the same extension is one, or three, or thirty-six, according as the mind considers it with reference to a yard, a foot, or an inch. Number is so visibly relative, and dependent on men’s understanding, that it is strange to think how any one should give it an absolute existence without the mind. 13. UNITY I know some will have to be A SIMPLE OR UNCOMPOUNDED IDEA, accompanying all other ideas into the mind. That I have any such idea answering the word UNITY I do not find; and if I had, methinks I could not miss finding it: on the contrary, it should be the most familiar to my understanding, since it is said to accompany all other ideas, and to be perceived by all the ways of sensation and reflexion. To say no more, it is an ABSTRACT IDEA. 17. PHILOSOPHICAL MEANING OF “MATERIAL SUBSTANCE”. – If we inquire into what the most accurate philosophers declare themselves to mean by MATERIAL SUBSTANCE, we shall find them acknowledge they have no other meaning annexed to those sounds but the idea of BEING IN GENERAL. 19. THE EXISTENCE OF EXTERNAL BODIES AFFORDS NO EXPLICATION OF THE MANNER IN WHICH OUR IDEAS ARE PROCUCED. – Though we give the materialists their external bodies, they by their own confession are never the nearer knowing how our ideas are produced; since they own themselves unable to comprehend in what manner BODY CAN ACT UPON SPIRIT, or how it is possible it should imprint any idea in the mind. Hence it is evident the production of ideas or sensations in our minds can be no reason why we should suppose Matter or corporeal substances, SINCE THAT IS ACKNOWLEDGED TO REMAIN EQUALLY INEXPLICABLE WITH OR WITHOUT THIS SUPPOSITION. 20. DILEMMA. – In short, if there were external bodies, it is impossible we should ever come to know it; and if there were not, we might have the very same reasons to think there were that we have now. 21. Were it necessary to add any FURTHER PROOF AGAINST THE EXISTENCE OF MATTER after what has been said, I could instance several of those errors and difficulties (not to mention impieties) which have sprung from that tenet. It has occasioned numberless controversies and disputes in philosophy, and not a few of far greater moment in religion. But I shall not enter into the detail of them in this place, as well because I think arguments A POSTERIORI are unnecessary for confirming what has been, if I mistake not, sufficiently demonstrated A PRIORI, as because I shall hereafter find occasion to speak somewhat of them. 26. CAUSE OF IDEAS. – We perceive a continual succession of ideas, some are anew excited, others are changed or totally disappear. There is therefore some cause of these ideas, whereon they depend, and which produces and changes them. That this cause cannot be any quality or idea or combination of ideas, is clear from the preceding section. I must therefore be a substance; but it has been shown that there is no corporeal or material substance: it remains therefore that the CAUSE OF IDEAS is an incorporeal active substance or Spirit. 27. NO IDEA OF SPIRIT. – A spirit is one simple, undivided, active being – as it perceives ideas it is called the UNDERSTANDING, and as it produces or otherwise operates about them it is called the WILL. Such is the nature of SPIRIT, or that which acts, that it cannot be of itself perceived, BUT ONLY BY THE EFFECTS WHICH IT PRODUCETH. 30. LAWS OF NATURE. – The ideas of Sense are more strong, lively, and DISTINCT than those of the imagination; they have likewise a steadiness, order, and coherence, and are not excited at random, as those which are the effects of human wills often are, but in a regular train or series, the admirable connexion whereof sufficiently testifies the wisdom and benevolence of its Author. Now THE SET RULES OR ESTABLISHED METHODS WHEREIN THE MIND WE DEPEND ON EXCITES IN US THE IDEAS OF SENSE, ARE CALLED THE LAWS OF NATURE; and these we learn by experience, which teaches us that such and such ideas are attended with such and such other ideas, in the ordinary course of things. 31. KNOWLEDGE NECESSARY FOR THE CONDUCT OF WORLDLY AFFAIRS. – This gives us a sort of foresight which enables us to regulate our actions for the benefit of life. That food nourishes, sleep refreshes, and fire warms us; that to sow in the seed-time is the way to reap in the harvest – all this we know, NOT BY DISCOVERING ANY NECESSARY CONNEXION BETWEEN OUR IDEAS, but only by the observation of the settled laws of nature, without which we should be all in uncertainty and confusion, and a grown man no more know how to manage himself in the affairs of life than an infant just born. 32. And yet THIS consistent UNIFORM WORKING, which so evidently displays the goodness and wisdom of that Governing Spirit whose Will constitutes the laws of nature, is so far from leading our thoughts to Him, that it rather SENDS THEM A WANDERING AFTER SECOND CAUSES. For, when we perceive certain ideas of Sense constantly followed by other ideas and WE KNOW THIS IS NOT OF OUR OWN DOING, we forthwith attribute power and agency to the ideas themselves, and make one the cause of another, than which nothing can be more absurd. 33. OF REAL THINGS AND IDEAS OR CHIMERAS. – The ideas imprinted on the Senses by the Author of nature are called REAL THINGS. The ideas of Sense are allowed to have more reality in them, that is, to be more (1) STRONG, (2) ORDERLY, and (3) COHERENT than the creatures of the mind; but this is no argument that they exist without the mind. 34. FIRST GENERAL OBJECTION. – ANSWER. &ndash We must now answer any objections, and if I seem too prolix to those of quick apprehensions, I hope it may be pardoned, since all men do not equally apprehend things of this nature, and I am willing to be understood by every one. FIRST, it will be objected that by the foregoing principles ALL THAT IS REAL AND SUBSTANTIAL IN NATURE IS BANISHED OUT OF THE WORLD. I ANSWER, that by the principles premised we are not deprived of any one thing in nature. Whatever we see, feel, hear, or anywise conceive or understand remains as secure as ever. 41. SECOND OBJECTION. – It will be OBJECTED that there is a great difference betwixt imagining oneself burnt, and actually being so. To which the answer is that if real fire be very different from the idea of fire, so also is the real pain very different from the idea of pain, and yet nobody will pretend that real pain can possibly be without the mind. 42. THIRD OBJECTION – It will be objected that we see things at distance from us, and which consequently do not exist in the mind. In answer to this, it may be considered that in a DREAM we do oft perceive things as existing at a great distance off, and yet those things are acknowledged to have their existence only in the mind. 45. FOURTH OBJECTION. – It will be objected that from the foregoing it follows things are every moment annihilated and created anew. The trees therefore are in the garden, or the chairs in the parlour, no longer than there is somebody to perceive them. Upon SHUTTING MY EYES all the furniture in the room is reduced to nothing, and upon opening them it is again created. In ANSWER to all which, I ask the reader whether he means anything by the actual existence of an idea distinct from its being perceived. 50. SIXTH OBJECTION. – You will say there have been a great many things explained by matter and motion; take away these and you destroy corpuscular philosophy, and undermine those mechanical principles which have been applied with so much success. To this I ANSWER that there is not any one PHENOMENON explained on that supposition which may not as well be explained without it. 51. SEVENTH OBJECTION. &ndash Is it not ABSURD TO TAKE AWAY NATURAL CAUSES, AND ASCRIBE EVERYTHING TO THE IMMEDIATE OPERATION OF SPIRITS? I ANSWER, that we ought to THINK WITH THE LEARNED, AND SPEAK WITH THE VULGAR. They who are convinced of the Copernican system do nevertheless say “the sun rises,” “the sun sets”. A little reflexion on what is here said will make it manifest that the common use of language would receive no manner of alteration or disturbance from the admission of our tenets. 54. EIGHTH OBJECTION. – The universal assent of mankind may be thought an invincible argument in behalf of Matter. I answer, FIRST, that it will not be found so many as is imagined do really believe the existence of Matter without the mind. SECONDLY, though we should grant a notion to be universally adhered to, yet this is weak argument of its truth. 56. NINTH OBJECTION. – It is demanded that we assign A CAUSE OF THIS PREJUDICE, and account for its obtaining in the world. To this I ANSWER, that men knowing they perceived several ideas, WHEREOF THEY THEMSELVES WERE NOT THE AUTHORS – as not being excited from within nor depending on the operation of their wills – this made them maintain those ideas, or objects of perception had an EXISTENCE INDEPENDENT OF AND WITHOUT THE MIND. 58. TENTH OBJECTION. – It will be objected that the notions we advance are inconsistent with several sound truths in philosophy and mathematics. For example, the motion of the earth is now universally admitted by astronomers as a truth grounded on the clearest and most convincing reasons. But, on the foregoing principles, there can be no such thing. For, motion being only an idea, it follows that if it be not perceived it exists not. 60. ELEVENTH OBJECTION. – It will be demanded to how the mechanism of animals and vegetables might grow, and shoot forth leaves with nothing powerful or operative in them? 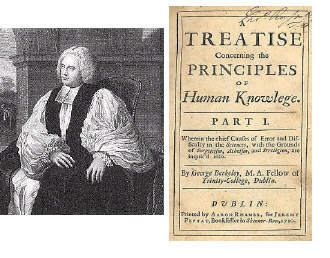 To which I answer, first, that though there were some difficulties relating to the administration of Providence, and the uses by it assigned to the several parts of nature, which I could not solve by the foregoing principles, yet this objection could be of small weight against the truth and certainty of those things which may be proved a priori. 82. OBJECTIONS DERIVED FROM THE SCRIPTURES ANSWERED. – Some there are who think that, though the arguments for the real existence of bodies which are drawn from Reason be allowed not to amount to demonstration, yet the Holy Scriptures are so clear in the point as will sufficiently convince every good Christian that bodies do really exist, and are something more than mere ideas; there being in Holy Writ innumerable facts related which evidently suppose the reality of timber and stone, mountains and rivers, and cities, and human bodies. To which I answer that no sort of writings whatever, sacred or profane, which use those and the like words in the vulgar acceptation, or so as to have a meaning in them, are in danger of having their truth called in question by our doctrine. And I do not think that either what philosophers call Matter, or the existence of objects without the mind, is anywhere mentioned in Scripture. 84.It will be urged that miracles do, at least, lose much of their stress and import by our principles. What must we think of Moses’ rod? was it not really turned into a serpent; or was there only a change of ideas in the minds of the spectators? And, can it be supposed that our Saviour did no more at the marriage-feast in Cana than impose on the sight, and smell, and taste of the guests, so as to create in them the appearance or idea only of wine? The same may be said of all other miracles; which, in consequence of the foregoing principles, must be looked upon only as so many cheats, or illusions of fancy. To this I reply, that the rod was changed into a real serpent, and the water into real wine. This does not in the least contradict what I have elsewhere said. 85. CONSEQUENCES OF THE PRECEDING TENETS. – Several difficult and obscure questions, on which abundance of speculation has been thrown away, are entirely banished from philosophy. “Whether corporeal substance can think,” “whether Matter be infinitely divisible,” and “how it operates on spirit” – these and like inquiries have given infinite amusement to philosophers in all ages; but depending on the existence of Matter, they have no longer any place on our principles. 86. THE REMOVAL OF MATTER GIVES CERTAINTY TO KNOWLEDGE. – From the principles we have laid down it follows human knowledge may naturally be reduced to two heads – that of ideas and that of spirits. And first as to ideas or unthinking things. Our knowledge of these has been very much obscured and confounded, and we have been led into very dangerous errors, by supposing a twofold existence of the objects of sense – the one intelligible or in the mind, the other real and without the mind; whereby unthinking things are thought to have a natural subsistence of their own distinct from being perceived by spirits. This, which, if I mistake not, is the very root of Scepticism; for, so long as men thought that real things subsisted without the mind, and that their knowledge was only so far forth real as it was conformable to real things, it follows they could not be certain they had any real knowledge at all. 88. IF THERE BE EXTERNAL MATTER, NEITHER THE NATURE NOR EXISTENCE OF THINGS CAN BE KNOWN. – So long as we attribute a real existence to unthinking things, distinct from their being perceived, it is not only impossible for us to know with evidence the nature of any real unthinking being, but even that it exists. Hence it is that we see philosophers distrust their senses, and doubt of the existence of heaven and earth, of everything they see or feel, even of their own bodies. But, all this doubtfulness, which so bewilders and confounds the mind and makes philosophy ridiculous in the eyes of the world, vanishes if we annex a meaning to our words. and not amuse ourselves with the terms “absolute,” “external,” “exist, “and such-like, signifying we know not what. I can as well doubt of my own being as of the being of those things which I actually perceive by sense; it being a manifest contradiction that any sensible object should be immediately perceived by sight or touch, and at the same time have no existence in nature, since the very existence of an unthinking being consists in being perceived. 91. SENSIBLE QUALITIES REAL. – It were a mistake to think that what is here said derogates in the least from the reality of things. All the difference is that, according to us, the unthinking beings perceived by sense have no existence distinct from being perceived, and cannot exist in any other substance than those unextended indivisible substances or spirits which act and think and perceive them; whereas philosophers vulgarly hold that the sensible qualities do exist in an inert, extended, unperceiving substance which they call Matter, to which they attribute a natural subsistence, exterior to all thinking beings, or distinct from being perceived by any mind whatsoever, even the eternal mind of the Creator. 92. OBJECTIONS OF ATHEISTS OVERTURNED. – For, as we have shown the doctrine of Matter or corporeal substance to have been the main pillar and support of Scepticism, so likewise upon the same foundation have been raised all the impious schemes of Atheism and Irreligion. All their monstrous systems have so visible and necessary a dependence on it that, when this corner-stone is once removed, the whole fabric cannot choose but fall to the ground, insomuch that it is no longer worth while to bestow a particular consideration on the absurdities of every wretched sect of Atheists. 93. AND OF FATALISTS ALSO. – That impious and profane persons should readily favour their inclinations, by deriding immaterial substance, and supposing the soul to be divisible and subject to corruption as the body; and instead thereof make a self-existent, stupid, unthinking substance the root and origin of all beings, is very natural. But, when men of better principles observe the enemies of religion lay so great a stress on unthinking Matter, and all of them use so much industry and artifice to reduce everything to it, methinks they should rejoice to see them deprived of their grand support, and driven from that only fortress, without which your Epicureans, Hobbists, and the like, have not even the shadow of a pretence, but become the most cheap and easy triumph in the world. 94. OF IDOLATORS. – The existence of Matter, or bodies unperceived, has not only been the main support of Atheists and Fatalists, but on the same principle doth Idolatry likewise in all its various forms depend. Did men but consider that the sun, moon, and stars, and every other object of the senses are only so many sensations in their minds, which have no other existence but barely being perceived, doubtless they would never fall down and worship their own ideas, but rather address their homage to that ETERNAL INVISIBLE MIND which produces and sustains all things. 95. AND SOCINIANS. – The same absurd principle, by mingling itself with the articles of our faith, has occasioned no small difficulties to Christians. For example, about the Resurrection, how many scruples and objections have been raised by Socinians and others? But do not they supose that the body is material substance? Take away this material substance and mean by body what every plain ordinary person means by that word, to wit, that which is immediately seen and felt, which is only a combination of sensible qualities or ideas, and then their most unanswerable objections come to nothing. 109. As in reading other books a wise man will choose to fix his thoughts on the sense and apply it to use, rather than lay them out in grammatical remarks on the language; so, in perusing the volume of nature, it seems beneath the dignity of the mind to affect an exactness in reducing each particular phenomenon to general rules, or showing how it follows from them. We should propose to ourselves nobler views, namely, to recreate and exalt the mind with a prospect of the beauty, order. extent, and variety of natural things: hence, by proper inferences, to enlarge our notions of the grandeur, wisdom, and beneficence of the Creator. 130. Of late the speculations about Infinities have run so high, and grown to such strange notions, as have occasioned no small scruples and disputes among the geometers of the present age. Some there are of great note who, not content with holding that finite lines may be divided into an infinite number of parts, do yet farther maintain that each of those infinitesimals is itself subdivisible into an infinity of other parts or infinitesimals of a second order, and so on ad infinitum. These, I say, assert there are infinitesimals of infinitesimals of infinitesimals, &c., without ever coming to an end; so that according to them an inch does not barely contain an infinite number of parts, but an infinity of an infinity of an infinity ad infinitum of parts. 135. We next treat of SPIRITS. The great reason that is assigned for our being thought ignorant of the nature of spirits is our not having an idea of it. But, it is manifestly impossible there should be any such idea, for a spirit has been shown to be the only substance or support wherein unthinking beings or ideas can exist; but that this substance which supports or perceives ideas should itself be an idea or like an idea is evidently absurd. 137. From the opinion that spirits are to be known after the manner of an idea or sensation have risen many absurd and heterodox tenets, and much scepticism about the nature of the soul. It is even probable that this opinion may have produced a doubt in some whether they had any soul at all distinct from their body since upon inquiry they could not find they had an idea of it. 138. But, by the word spirit we mean only that which thinks, wills, and perceives; this, and this alone, constitutes the signification of the term. 139. But it will be objected that, if there is no idea signified by the terms soul, spirit, and substance, they are wholly insignificant, or have no meaning in them. I answer, those words do mean or signify a real thing; that what I am myself, that which I denote by the term I, is the same with what is meant by soul or spiritual substance. 140. OUR IDEA OF SPIRIT. – In a large sense, indeed, we may be said to have an idea or rather a notion of spirit; that is, we understand the meaning of the word, otherwise we could not affirm or deny anything of it. Moreover, as we conceive the ideas that are in the minds of other spirits by means of our own, which we suppose to be resemblances of them; so we know other spirits by means of our own soul. 147. THE EXISTENCE OF GOD MORE EVIDENT THAN THAT OF MAN. – Hence, it is evident that God is known as certainly and immediately as any other mind or spirit whatsoever distinct from ourselves. We may even assert that the existence of God is far more evidently perceived than the existence of men; because the effects of nature are infinitely more numerous and considerable than those ascribed to human agents. 148. It seems to be a general pretence of the unthinking herd that they cannot see God. Could we but see Him, say they, as we see a man, we should believe that He is, and believing obey His commands. But alas, we need only open our eyes to see the Sovereign Lord of all things, with a more full and clear view than we do any one of our fellow – creatures. But when we see the colour, size, figure, and motions of a man, we perceive only certain sensations or ideas excited in our own minds. Hence it is plain we do not see a man which lives, moves, perceives, and thinks as we do – but only such a certain collection of ideas as directs us to think there is a distinct principle of thought and motion, like to ourselves, accompanying and represented by it. And after the same manner we see God; whithersoever we direct our view, we do at all times and in all places perceive manifest tokens of the Divinity. 149. That the discovery of this great truth, which lies so near and obvious to the mind, should be attained to by the reason of so very few, is a sad instance of the stupidity and inattention of men, who, though they are surrounded with such clear manifestations of the Deity, are yet so little affected by them that they seem, as it were, blinded with excess of light. 156. For, after all, what deserves the first place in our studies is the consideration of GOD and our DUTY; the better dispose them to reverence and embrace the salutary truths of the Gospel, which to know and to practice is the highest perfection of human nature.